Cavendish School of English is situated in a historic house in Valletta which was built in the 1900's. Valletta is the smallest capital within the EU. 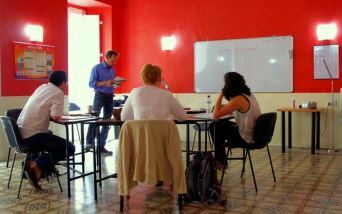 Why learn English in Valletta? Why a language school in Valletta? English is one of the two official languages in Malta – a legacy from 164 years in the British Empire. At Cavendish School of English, the classes are small and intimate, typically between 6 and 10 students, and never more than 12 within the class. • Air conditioned comfort with natural light all year round. • Internet café & Wi-Fi. • Cosy cafeteria and lounge area. • An apartment with roof –top terrace (for our English language students bookable as holiday home).